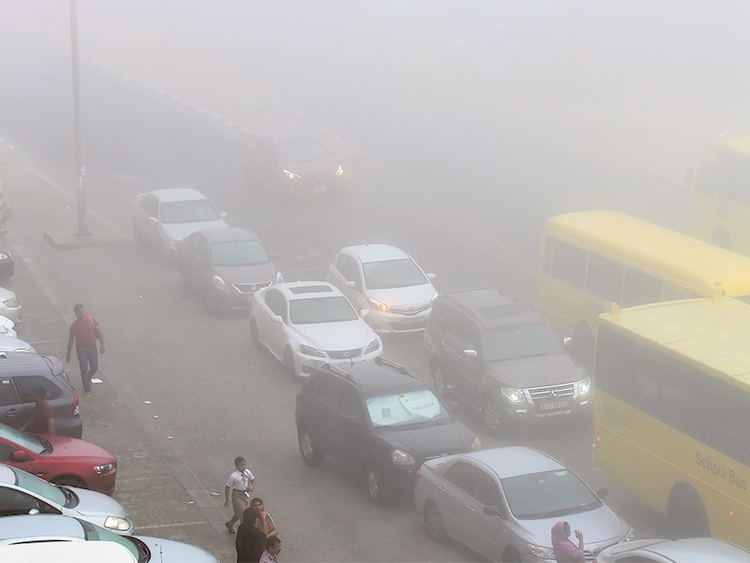 Dubai: The season of the dreaded fog has returned. Residents woke up to heavy fog on their first day back to work after the long weekend break, with thick mist also blotching the air. The National Centre of Meteorology (NCM) on Tuesday issued an orange alert to motorists, cautioning road users to drive with caution after visibility was reduced to 500 metres in the early morning. The NCM also advised that the foggy weather will continue until 9am in patches across the UAE, with visibility reduced to 1,000 metres in some coastal and offshore areas in the Arabian Gulf. The fog and mist continued from Monday night and into the early morning, leaving residents on Tuesday to find many parts of the country still affected with reduced road visibility, including the major highways leading out of Abu Dhabi and heading to Dubai, Al Ghuwaifat and Al Ain. Residents all the way from Ras Al Khaimah to Abu Dhabi witnessed the thick blanket of fog, which peaked from 4am to 6am, and is expected to reoccur over the next two days. The NCM said the minimum temperature will be 16-21 degrees Celsius in coastal and internal areas, with lows of 10-14 degrees Celsius in the mountain area. However, the level of humidity will peak at 95 per cent across coastal and internal areas until Thursday, bringing temperatures to reach up to 31 degrees Celsius by midday. Abu Dhabi Police urged motorists to be alert on the roads and to drive with caution due to fog reducing visibility, and warned road users not to use their mobile phones to take videos or photos of the bad weather conditions. This means that residents should be on the alert as hazardous weather events are forecast, and should comply with advice issued by authorities. The weather until Thursday will become fair to partly cloudy at times, with the level of humidity expected to rise late at night and into the early morning over some internal and coastal areas. The chance of fog and mist will form across the UAE, accompanied with light northeasterly to northwesterly at speeds of 15 - 25 km/h, reaching 35 km/h at times. Offshore conditions will be slight to moderate in the Arabian Gulf and in the Oman Sea.